Office of the Resident Commissioner Govt. 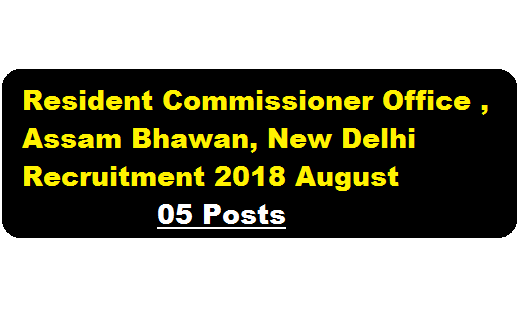 of Assam Recruitment 2018 August :- Office of the Resident Commissioner, Government of Assam, Assam Bhawan, New Delhi has issued a recruitment notification in august 2018. According to the latest Resident Commissioner Govt. of Assam Recruitment 2018 , Applications are invited from intending and eligible candidates, who are citizens of India as defined in the Articles 5 to 8 of the Constitution of India in prescribed Standard Form of Application given in Part-IX of the Assam Gazette for filling up Chowkidar and Room Bearer vacancies in the office of the Resident Commissioner, Government of Assam, Assam Bhawan, No. 1 Sardar Patel Marg, Chanakyapuri, New Delhi. We have mentioned detailed info regarding the recruitment in the following section. In this section, we will discuss in detail about Recruitment of Chowkidar & Room Bearer Posts under Office of the Resident Commissioner Govt. of Assam Recruitment 2018 August with all the details and requirement. Number of Post : 01 (One) [UR] Scale of Pay : PB1: 12000 – 37500/- + Grade pay UR 3900/- per month plus other allowances admissible as per rules issued from time to time. Number of Post : 04 (Four) [UR, OBC/MOBC, SC & UR] Scale of Pay : PB1: 12000 – 37500/- + Grade pay UR 3900/- per month plus other allowances admissible as per rules issued from time to time. Age limit : Candidate should not be more than 44 years and less than 18 years as on 1st January 2018. The upper age is relaxable by 5 years in case of SC/ST and 3 years in case of OBC/MOBC Candidates and persons with Disabilities respectively. i) Self-attested photocopies of all certificates of Educational Qualification and other Qualification, Age, Caste etc. alongwith other testimonials. ii) Three copies of self-attested recent passport size photograph (one copy to be pasted on the right top corner of the Application Form signed by the applicant and the other two copies to be signed by the applicant on the reverse of the photograph must be attached with the application). iii) A self-addressed envelope affixing Postal Stamp of Rs. 5.00 must be enclosed alongwith the application form. Address : Application to be addressed to the Office of the Resident Commissioner, Government of Assam, Assam Bhawan, No. 1, Sardar Patel Marg, Chanakyapuri, New Delhi-110021. 1) Educational Qualification: Minimum Class VI Passed. 2) Age limit: Candidate should not be more than 44 years and less than 18 years as on 1st January 2018. The upper age is relaxable by 5 years in case of SC/ST and 3 years in case of OBC/MOBC Candidates and persons with Disabilities respectively. 3) Appointment against sanctioned vacant post will be made in accordance with the provision of Assam Fiscal Responsibility and Budget Management Act, 2005 under Section 7 (1) (G). 4) Selection of candidates will be provisional and the Board has the right to accept or reject the candidature at any stage of recruitment after proper scrutiny of the documents/testimonials etc. 5) The selection process will comprise of Interview/Viva-Voce. 6) The candidate who appear for Interview/Viva-Voce must produce original testimonials for verification. 7) Candidate will have to appear for Interview/Viva-Voce at their own expenses. No TA/DA will be borne by the Government for this purpose. 8) The application for the post of Chowkidar and Room Bearers whose application is found in order will be called for interview and the date and venue of the interview will be notified later on. Appointment shall be made only after police verification as per procedure. 9) Selected candidates will have to submit an undertaking to the Appointing Authority that they will abide by the New Pension Rules of Government. 10) Candidate should be well versed in working knowledge of Assamese. 11) Canvassing directly or indirectly in any form will disqualify the candidature of the candidate. 12) Important Date: Last date for receipt of the application is 14.09.2018 and no application will be entertained thereafter. 13) Incomplete Application and applications submitted after the schedule date will not be accepted.